The developer of the two-tower Millennium Hollywood, located just next to the Capitol Records building in Hollywood, has agreed with the city of Los Angeles to limit the buildings’ heights to 35 and 39 stories, reports Curbed LA. The original proposal put forth heights of 485 and 585 feet (that’s roughly 48 and 58 stories). Millennium said that the total square footage of the project—more than one million square feet—and the number of residential (492) and hotel (200) units will not change. 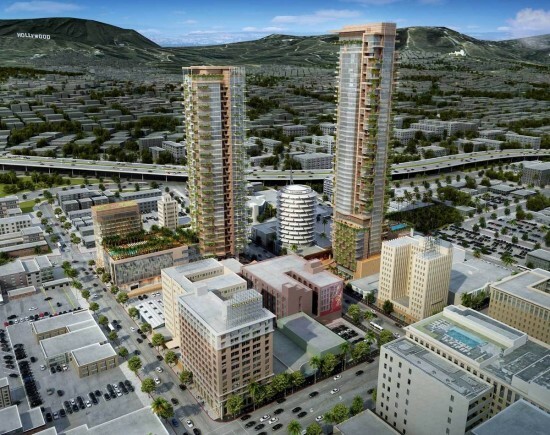 The agreement was reached at LA City Council’s Planning and Land Use Management Committee. This means the buildings will dwarf the iconic Capitol Records building slightly less, although the move probably won’t soothe locals fears about increased congestion. Meanwhile according to the LA Times, the California Department of Transportation has accused city of officials of ignoring their concerns about the project’s impact on the city’s freeways. Stay tuned as this drama unfolds.